Pinnacle's new SoundBridge HomeMusic is the Roku SoundBridge repackaged, but still powered by the same open source server software. The latest software update provides the ability to stream AppleLossless music files. The tubular box works by streaming music from your Mac or the web, and doesn't require router configuration - you don't even need a router. Your Mac will beam tracks to the SoundBridge, which can also share its internet connection, thanks to the FireFly software it comes with. We experienced near-instant transmission inside a 30ft range from a MacBook Pro. The SoundBridge doesn't have any speakers; it outputs its signal to a set of power speakers (not included) or your stereo via a 3.5mm audio-out jack. There's a headphone jack and, uniquely for this type of device, slots for SD or MMC memory cards, from which it can also play back music. Competitors include the Slim Devices Squeezebox and Terratec iRadio, which cost more but come with speakers. The obvious question for Mac owners is whether or not the SoundBridge can now stream AAC files bought from the iTunes Store. This is a common complaint from owners of audio- streaming devices, as these files are protected by Apple's FairPlay system and resist streaming efforts. Sadly, the SoundBridge won't stream FairPlay-protected files. The songs show up on the SoundBridge's display panel, but they appear with a padlock symbol and refuse to play back. It will stream AAC files, but not those bought from Apple. This is more Apple's fault than Pinnacle's, though. Streaming music from your library, or from web radio, is easily done. Everything is controlled with the remote. You browse, select and play. Each time you add a new library you need to reboot, but this is done automatically, and yes, you can browse multiple Macs as long as they are in range and have FireFly installed. 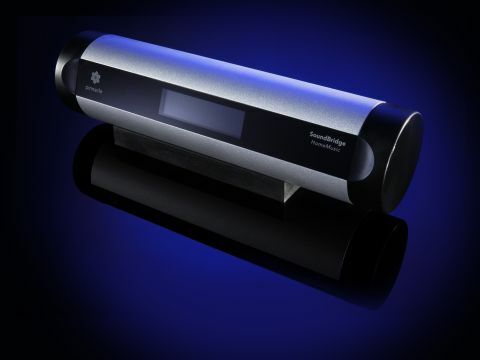 Two models are available: the SoundBridge M1001 (£135) and SoundBridge HomeMusic (picture; £99). The only difference is the M1001 has an Ethernet port, giving it a faster data-transfer option and longer range, and a wider LCD display for file browsing. Just remember not to lose the remote. Both transmit using the 802.11b and g wireless standards. If you're looking for a networkable radio for the home and don't have a stereo there already, consider the iRadio; if you have a big budget, consider the better-quality Squeezebox. Those already with a stereo are better off with the fun-to-use SoundBridge - and connecting the two is as easy as plugging in a RCA cable, which is supplied.